An opportunity for therapists to embrace and deepen our own interior journey and thus make ourselves more able to connect with our clients at a deeper and more meaningful level. Integrating insights from modern consciousness research, anthropology, various depth psychologies, transpersonal psychology, body psychotherapy, Eastern spiritual practices and mystical traditions of the world, and drawing on the work of Dr Frank Lake, Dr Jim O’Donoghue, Dr Wiiliam Emerson, Dr David B. Chamberlain, and others, Breathwork in Expanded States of Consciousness is a powerful approach to self-exploration and healing. It is based on a broad understanding of the human psyche that includes biographical, pre- and peri-natal, and transpersonal dimensions, and phenomena from all these domains are seen as natural and normal constituents of the psychological process. As the process of entering an expanded state of consciousness unfolds, intrinsic healing energy in the psyche and the body begins to manifest a therapeutic wisdom that transcends the knowledge that can be derived from cognitive understanding only. Arlene will be at the Centre on Tuesdays and Thursdays from 9.30 till 5.00. At a later date and if there is enough demand, she will also offer evening appointments. Prices are listed below – all very competitive! Cleanse, tone, moisturise, facial massage with essential oils then relax with a lovely scalp massage whilst the mask balances and refreshes your skin. Relaxing full body massage including face and scalp using a selected blend of essential oils. Traditional Swedish deep tissue massage to rejuvenate tired and aching muscles, particularly post sport. Releasing tension out of muscles can help headaches and poor posture. Spiritual and nurturing full body massage using warm oil given in fluid, rhythmic motion using forearms as well as hands. Promotes deep healing physically and emotionally. During this Taster Session you will get to experience Lomi Lomi on the back and back of legs. A luxurious massage using smooth heated lava stones to ease out deep tension within the muscles. Using original Biosun high quality candles with Chamomile, Sage and Honey, a very soothing treatment to draw out impurities within the ear canal then finishing with a lymphatic drainage facial massage. Can help with sinus problems, headaches, improving balance and the senses. Using pressure to specific reflex points on the feet that correspond to all your bodies systems helps restore balance and promotes deep physical and emotional healing within this session. Arlene will also be offering a MIX AND MATCH MENU – Pick any 2 of the 30 minute treatments below for just £40. 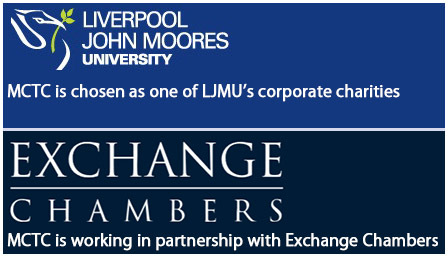 MCTC is proud to have been both nominated and chosen as one of LJMU’s corporate charities. We are really excited about the opportunities for working in partnership with LJMU. We had our first meeting with the LJMU team in February and are now looking forward to all kinds of collaboration and mutual support through promotion, facilities, staff development, media, working with individual schools and faculties, graduate internships etc and having a presence at key LJMU events including the Teaching and Learning and Professional Services Conferences in June and the Student Welcome Event in September. Thanks to our nominator and to LJMU for choosing MCTC. 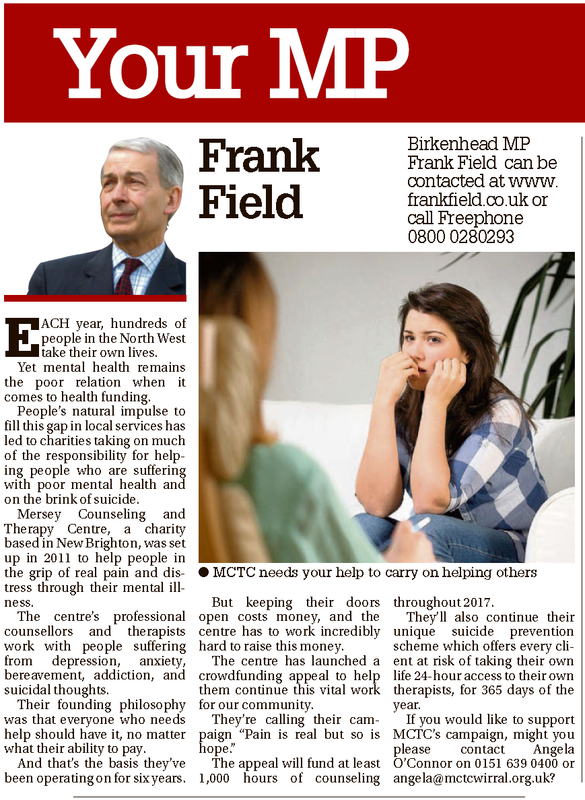 EACH year, hundreds of people in the North West take their own lives. Yet mental health remains the poor relation when it comes to health funding. People’s natural impulse to fill this gap in local services has led to charities taking on much of the responsibility for helping people who are suffering with poor mental health and on the brink of suicide. Mersey Counselling and Therapy Centre, a charity based in New Brighton, was set up in 2011 to help people in the grip of real pain and distress through their mental illness. The centre’s professional counsellors and therapists work with people suffering from depression, anxiety, bereavement, addiction, and suicidal thoughts. Their founding philosophy was that everyone who needs help should have it, no matter what their ability to pay. And that’s the basis they’ve been operating on for six years. But keeping their doors open costs money, and the centre has to work incredibly hard to raise this money. The centre has launched a crowdfunding appeal to help them continue this vital work for our community. The appeal will fund at least 1,000 hours of counselling throughout 2017. They’ll also continue their unique suicide prevention scheme which offers every client at risk of taking their own life 24-hour access to their own therapists, for 365 days of the year. If you would like to support MCTC’s campaign, might you please contact Angela O’Connor on 0151 639 0400 or angela@mctcwirral.org.uk? Please help if you can so more people can get help and support. When my children were young, they used to complain about me nagging. My response was, ‘As soon as you do the thing that I am asking you to do, the nagging will magically stop’! Our distribution list (ie those of you who are receiving this directly from MCTC) consists of just over 1000 people. Admittedly, if you all donated £25.00 right now, we would reach our target today! In case you missed it, here is the link (41mins and 19 secs into the programme) to an interview with the Director of MCTC and Melanie (not her real name) on 25th January 2017. The BBC wanted to talk about why MCTC are spending so much time and effort raising funds through a crowdfunding campaign, PAIN IS REAL BUT SO IS HOPE, when the government talks so much about the priority it gives to mental health – IT’S A GOOD QUESTION! They also wanted to talk to someone about their experience of therapy and Melanie volunteered. It’s a very short interview – only about 3.5 minutes – so please give it a listen – our bit is at 41:20 minutes and it’s only available for another 3 weeks or so. …Then perhaps you would forward it on to your contacts and encourage them to listen and donate too. YOU CAN ALL HELP US WITH OUR CROWDFUNDING CAMPAIGN. We are beginning a campaign to raise £25,000 to provide 1000 therapy sessions for people suffering from mental and emotional pain & distress. Including 24 hour service for people feeling suicidal. Their pain is real, let us provide hope. To get involved with our crowdfunding campaign is simple. You just need to go to our crowdfunding website, decide if you want to donate directly or to fundraise on our behalf, and then just follow the instructions. We are using JustGiving as the service to support our crowdfunding campaign, so its familiar and safe. If you wish to donate, you’ll need to have a JustGiving account. This is simple to create and will also come in handy for any future charities you wish to support. When it comes to payment you have an option of using a credit or debit card, or PayPal … this is up to you. If you are a taxpayer, you can select the gift aid option and then the tax chappy will send us some more money … Whoop! If you want to fundraise, all you need to do is think of your fundraising activity, again visit our crowdfunding website, select the fundraising option and then follow the instructions. Again you’ll need an account, but after that it’s just a matter of completing some details like why you are raising money for MCTC and what you will be doing as your fundraising initiative. Once you have complete this you will be offered a chance to add this to your social media feeds so that others can support you … It’s that simple. So, to all of you who are tempted to help us, give into the temptation and go for it … the money is essential to the great work MCTC does. If you need more convincing go to our client stories page on our website, and see the impact of our work. We’ll be updating the stories during our campaign between now and the end of April. MCTC is asking for YOUR help this Christmas. Our clients are relying on our support this Christmas. For those needing our help Christmas i s a particularly challenging time. Whilst MCTC offers unique support, in terms of accessibility, low to zero cost for the client, and commit to support the client until they regain their independence, this cannot be done without resorting to fundraising. Generally, we take a passive approach to requesting support, but this Christmas we need to ask directly that you help us if you can. Giving the gift of hope this Christmas through your generosity of spirit would make a significant difference to the lives of our clients. Providing comfort, solidarity and the help to develop the coping mechanisms they may need. It is an unfortunate reflection on our world that so many people with very real difficulties find it so hard to get the help they need, because of the crisis of care affecting our country and region. MCTC provides this help, but needs you to sponsor them. This Christmas we particularly need your help. We’ve made it easy for you to help us by making the following facilities available. You can donate up to £20 by texting to 70070 and adding MCTC14 and the ££ you want to give. You can go to their website using your mobile phone or computer and make a single donation or set up a regular donation. The last 12 months has seen us double the number of clients we are seeing but that placed a strain on our finances. MCTC RECEIVES NO STATUTORY OR NHS FUNDING. We urgently need your help so are requesting that you donate as much as you can afford as quickly as possible. Let us try to bring hope to those in need this Christmas. If you are unable to help, could you please circulate this to others you know who may be able to help us. It’s so very important. Sometimes feelings can be difficult to put into words…..
No artistic experience or expertise needed. All of the above is fundamentally Anti-Therapeutic. We believe that access to counselling and psychotherapy should be available to anyone who needs it and that it should be accessible quickly and affordably. We believe that people who take the courageous step to seek help (not easy in a social and cultural climate that stills largely ignores, marginalises, isolates and stigmatises and discriminates against people who are seen to be suffering from mental ill-health), should be met quickly and efficiently, with warmth and openness and should be supported until their difficulties have been resolved or overcome. We believe Anyone presenting for counselling or psychotherapy is entitled to expect service, care and provision and, crucially, a positive change in their condition as therapy progresses. For all these reasons, MCTC offers a service that addresses these issues and offers true therapy from the moment someone makes contact with the Centre.